Room was nice and comfortable bed. Staff in restaurant in evening very friendly. Das Frühstück war richtig gut, die Rezeption auch immer sehr freundlich und kompetent besetzt. Die Zimmer sind schön und sauber. Grandioses Preis-Leistungs-Verhältnis, ein wunderschönes Hotel! Oproti loňskému roku kdy ke snídani bylo možné si objednat pouze omeletu na čtyři způsoby tak letos uz formou švédských stolů. Jediná změna k lepšímu. В целом место порадовало, и номер огромный и красивый... даже куча мелких недочётов в виде незакрывающейся балконной двери, пыльной веранды, недостроя местми не исортили впечатление. В кофе у бассейна нет меню на английском... только на сербском. Сам бассейн это место поломничества местных... но всё очень уютно и прилично. Интернет работал отлично. Big rooms. Staff knows only Serbian. They tryed to be helpful. Alle sind sehr nett, freundlich. Der Pool war für uns sehr schön. Sehr nettes Personal. Providing free WiFi, a sun terrace with a swimming pool, garden and shared lounge, Hotel Euforia Lounge is set in Šabac. Featuring a 24-hour front desk, this property also welcomes guests with a restaurant and a children's playground. Guests can have a drink at the bar. At the hotel, the rooms have a desk, a TV and a private bathroom. All rooms are equipped with air conditioning, and selected rooms will provide you with a balcony. All rooms include a wardrobe. Bijeljina is 28 miles from Hotel Euforia Lounge. 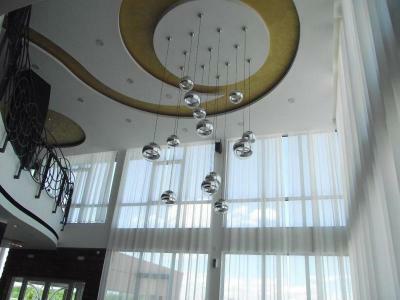 The nearest airport is Belgrade Nikola Tesla Airport, 47.8 miles from the property. Hotel Euforia Lounge has been welcoming Booking.com guests since 2 Jul 2014. When would you like to stay at Hotel Euforia Lounge? This twin room features a seating area, patio and private entrance. House rules Hotel Euforia Lounge takes special requests - add in the next step! Hotel Euforia Lounge accepts these cards and reserves the right to temporarily hold an amount prior to arrival. Swiming pool was closed. Staff knowing only Serbian. No heating inside the room and the outside temp was below 0C. Sheets were not clean, even torn at one spot. AC was blowing cold air as well. One staff member only but pretty pleasent. I think it would have been good to have both bath soap and shampoo supplied and perhaps a bottle of water supplied. Just small things I have come to expect that as most hotels outside of Europe provide. The inside room sofa with rats smels. Swiming pool closed for a private party. The room access coridor full of chairs, beds and others stuff. Remote control for TV set with no batteries.